If buyers are required to subscribe (or become members) of your site before they can access the marketplace, then Website terms and conditions template: marketplace: goods: buyer subscribes for access should be the other document you need to complement this one. 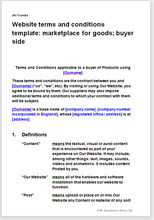 The complementary template that provides terms for sellers can be found at Website terms and conditions template: marketplace: goods: seller side. This template allows you to comply with the Electronic Communications and Transactions Act 2002. The Consumer Protection Act 2008, and other consumer protection legislation allowing your sellers to sell to businesses or consumers.